I just re-read my bullets above and even got excited again myself!All I can add is "Every girl deserves a tutu" - and why should it only be little girls who have all the fun! 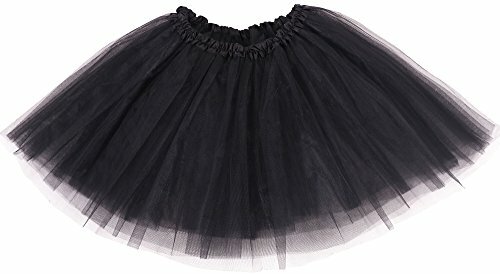 This 1950's Vintage Tutu is just perfect for big girls and those of us "not 21 anymore" so go ahead, spoil yourself, and put it in your basket NOW. 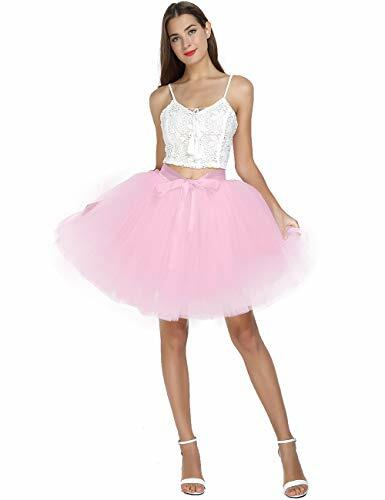 SIZE HELP-Regular Size-Length Lining Skirt- 15"Length Waist to End of Tulle Strands- 20"Relaxed Waist- 23"Fully Stretched Waist- 45"Plus Size-Length Lining Skirt- 15"Length Waist to End of Tulle Strands- 20" Relaxed Waist- 28"Fully Stretched Waist- 50" DANCINA GUARANTEE-And remember Dancina guarantees you'll be 100% happy with FREE no questions asked returns for any reason at all. 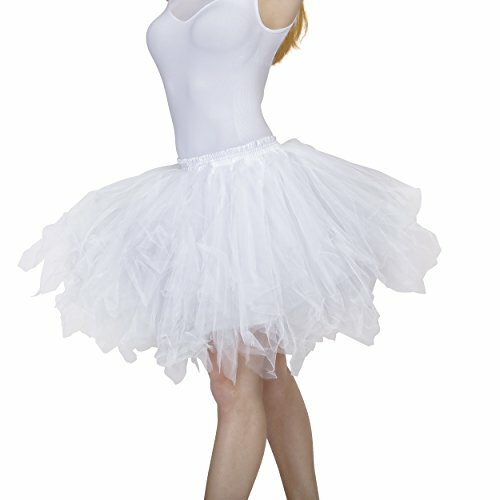 So put this Dancina tutu in your basket totally risk-free NOW! Colorful Rainbow tutus for girls available at lovely store! 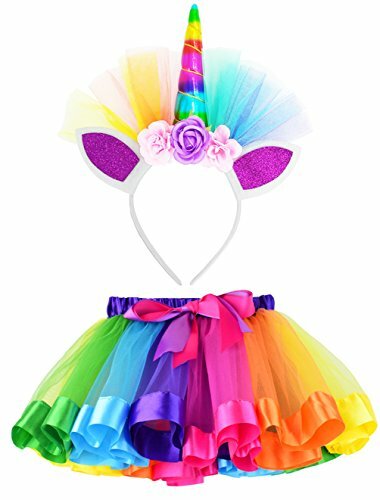 Matching unicorn horn headband carefully selected for Features:*tutus made by different colored high quality Tulle. Elastic waist which can fit kids at different age. The headband fits girl over 2 year old. Suitable for different occasions, great gift for your little girl. Colors: 4 colorful tutus with headbands are available at the moment. Size: size M age 2-4 years length 9.7" Adjustable waist 9.3" - 16.4"Size L age 4-8 years length 11.2" Adjustable waist 10" - 19.2"Tip:*we suggest hand wash and air dry. Please allow a bit measurement difference. (0.5")*If your girl slightly fat or thin than the same age please plus or minus one size. Any other questions please feel free contact us, enjoy your shopping! The elegant bodice feature is made of sparkling sequins and tutu tulle at the bottom. The skirt has 6 layers, top 3 layers are made of elegant tulle. 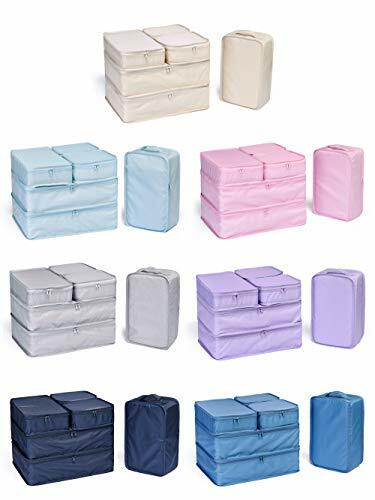 4th is layer of soft satin, 5th layer is a netting attached to the 6th layer for additional fullness, the 6th layer is a satin lining to bring comfort to your little girl while wearing the dress. You won't believe how adorable your little girl will look in this sweet dress! With the beautiful pink color, classic Ariel graphic, and stylish tulle skirt - this is a dress that you will put on her again and again. She will love the girly details like the frilly skirt. Baby girl will be cute and comfy in the soft jersey bodice and tulle & jersey-lined skirt. Easy to dress up with fancy sandals or down with funky sneakers! 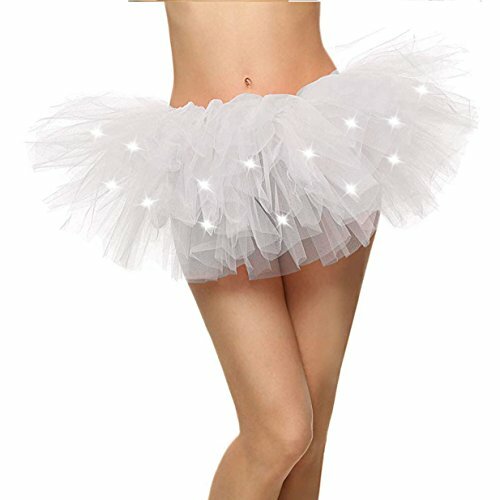 How to make a beautiful yet simple long tutu dress!! !